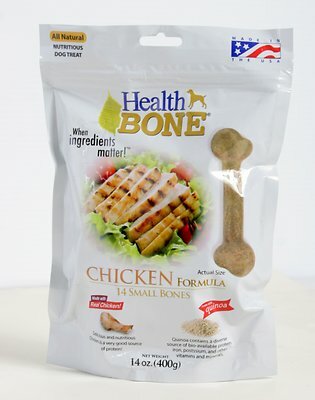 Health Bone Chicken Formula Dog Treat is made with ingredients that matter! Health Bone Chicken Formula’s number one ingredient is chicken. Even better they are made with real chicken meal vs chicken by-product meal. Chicken meal is a high source of protein and contains many essential amino acids. Made with all natural super food ingredients, each treat is high in vitamins, minerals, essential acids, antioxidants and more. Included are amazing super foods like quinoa, rice and oatmeal, plus added flax seed, rosemary, green tea. Why treat your dog to anything else but the best! 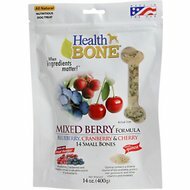 Available in a variety of quantities and 2 different bone sizes – small and medium bone treats. Chicken Meal, Rice, Quinoa, Rice Flour, Oatmeal, Ground Flax Seed, Calcium Carbonate, Natural Flavor, Canola Oil, Ground Rosemary, Green Tea Extract, Preserved with Mixed Tocopherols. Feed to your dog as a healthy treat or snack. Feed 1 Health Bone per day as a treat or reward. Always monitor your dog when giving treats. This product is intended for intermittent or supplemental feeding only. Make sure to have plenty of fresh water available at all times. Keep package sealed when not in use. Store at room temperature and away from heat. 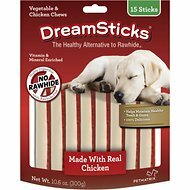 I HAVE 3 SMALL DOGS AND THEY LOVE ALL TREATS, BUT THEY WOULD NOT EAT THESE CHICKEN BONES. The dogs loved the taste but they only lasted ten minutes! Too expensive ..
One of my dogs recently has gone through some stomach (bowel) issues. I needed to find something natural/chicken that he could have to chew. These treats did not upset his system at all. Finally, a healthier bone for my dogs to enjoy! I have been looking for years for a bone that looks like a bone, is the size of a bone that would last for awhile. I found it in this Omega product. I also really wanted a treat that has a higher than normal crude protein and this product is 22% My dogs love them and I love knowing that they are getting a treat that isn't bad for them. Okay, but not small enough. We have a chihuahua mix and although she likes the smell of these bones and seems to be interested in them, they are not small enough and so she won't chew them.